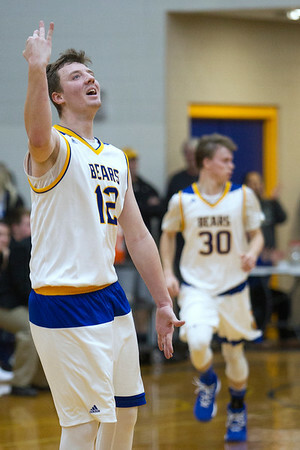 The Buckley Bears took on Glen Lake Lakers at home Tuesday night to win the boys basketball game 73-59. Buckley's Austin Harris (12) reacts to a shot by his teammate during the second quarter of the game against Glen Lake at Buckley High School on Tuesday. The Bears beat the Lakers 73-59.